2. Lightly oil grill, and place bratwurst on grill. Cover bratwurst and grill for 5-6 minutes, turning the bratwurst frequently. Remove. 3. Brush both sides of the veggies with oil and place on the grill 2-3 minutes per side. Remove. Let cool, and thinly slice peppers. 4. 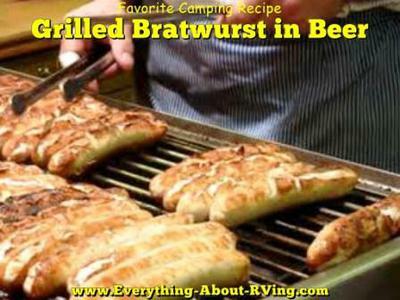 Place aluminum pan on grill, using indirect heat, add the beer, bratwursts and veggies and cover with foil. Grill for 18-20 minutes. 5. Butter and lightly oil inside of onion rolls and place buttered side down on the grill during the last 2-3 minutes. Grill 1-2 minutes until brown. Remove. 6. Place rolls on a serving dish, add bratwursts and top with veggies.